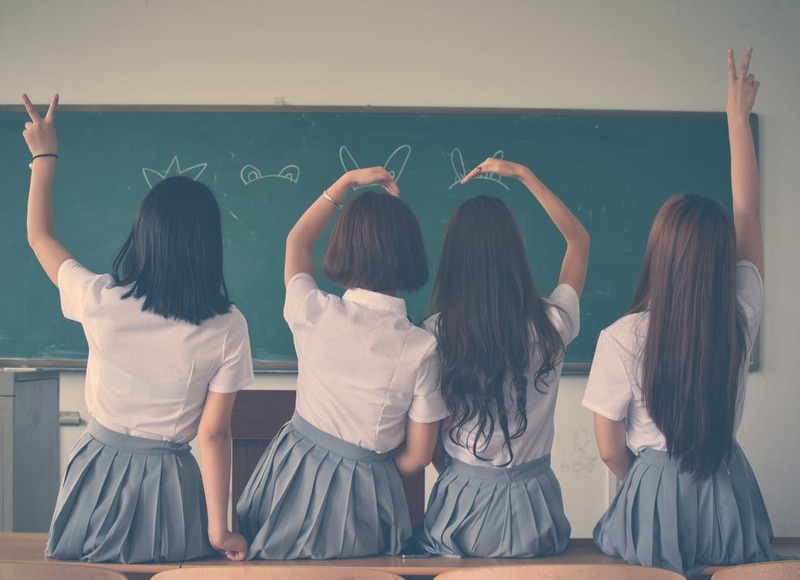 Nonverbal Cues: The Classroom Management Tool You Should Start Using This Year! If you're like me, by this time in the summer you're already making plans for the next school year. You probably spent some time early in the summer reflecting on the previous school year and making a list of what worked and what didn't. 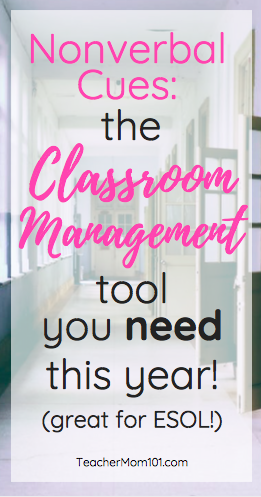 I would wager that if you took a poll of a hundred classroom teachers of varying levels of experience, you'd probably find that most of them felt that their classroom management plan could use some work. Even the best classroom management plans and strategies can use tweaking and improvement. I like to have a solid plan in place with 15 contingencies because that makes me feel at peace (I tend to overplan... everything). So every year, I add and subtract things in my plan to make it as efficient and comprehensible as possible. I have had a fantastic Positive Behavior Support (PBS) plan that I use in my middle school classroom that has been wildly successful at managing student behavior, but that is only one part of the classroom management equation. As I have stated in many other posts, I hate wasting time. We just don't have enough days in the year that aren't dedicated to testing or other nonsense that can be spent on solid instruction, and I like to make the most of that time. This means finding ways to minimize disruption - even positive and necessary disruption (like needing to sharpen a pencil or use the restroom). 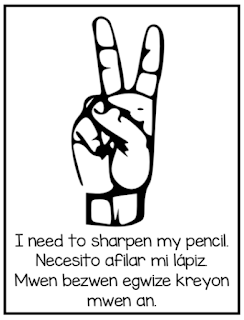 In a effort to both minimize these kinds of disruptions and support my ESOL students who are still grappling with the language, I started using nonverbal cues in my classroom. The easiest way to do this is to use hand signals that are designated for specific needs such as needing to sharpen a pencil, or needing to use the bathroom. At the beginning of the year, I teach these hand signals to my students and we practice using them. I post large aminated signs that have each hand signal on them, as well as what each one means - in 3 langauges - English, Spanish, and Haitian Creole (as this serves a majority of my students). This is great because students who are brand new and don't know a word of English yet can still ask to use the bathroom without feeling intimidated. Also, students can communicate their needs to me without the lesson having to stop, without blurting, without the disruption. When students fail to use the appropriate hand signal, I remind them. For example, if a student shouts out "Miss, I need to go to the bathroom!" I simply say to them, "what is the appropriate way to ask to go to the bathroom?" And then I wait for them to do it correctly. 90% of the time, they just forget because teenagers are impulsive and their mouths work faster than their brains! If I do have a stinker who is purposefully being dusruptive and refusing to use the correct protpcol - I follow my PBS plan for disruption. The ost important thing to remember is to be consistent. The second you start letting kids go to the bathroom without using the correct hand signal, or turn a blind eye when one gets up and slinks to the pencil sharpener without asking, and it's all over. Students will assume that the whole plan has gone out the window, and it's really difficult to reign it in once chaos as begun. However, if this should occur - because let's face it, we all get so busy and sometimes it can seem trivial to focus on who is sharpening their pencil - and the whole plan goes out the window, you can recover! Have a refresher. Go over the expectation with students as if it were the first day of school all over again. Explain the hand signals, what they mean, and when they should be used. And then go back to being consistent. It might take a few days, but the train can be returned to the tracks! I would also recommend going over expectations after long breaks - Thanksgiving break, Winter break, spring break - even a long weekend. Start class that first day back with a quick 10 minute review of the expectations. This keeps them fresh in the minds of your impulsive teenage students, and also lets them know that you are serious about following that plan with fidelity. If you would like to view or use the nonverbal cue signs that I use in my classroom, you can download them using the links below. One is a PDF that has the cues in 3 languages, and the other is an editable Word document if you want to only display them in English or if you have students who speak other languages. Feel free to download them! This may seem like a small tool, but I promise it offers huge payoff. Give it a try this school year, and let me know what you think!